ANCHORAGE — Roman Dial wanted to know how far he could hike across the Alaska wilderness carrying all his own food, gear and supplies. The trekker found out this summer by hiking 622 miles in northwest Alaska, carrying a pack that in the beginning weighed 59 pounds — 42 pounds of that in food, including 45 chocolate bars, 40 small bags of chips, 3 pounds of almond butter, brown sugar, freeze dried meals, butter, noodles, olive oil, dried cherries, mashed potato powder, cocoa and powdered milk. Dial, a 45-year-old professor of biology and mathematics at Alaska Pacific University in Anchorage, and two other trekkers started from the village of Kivalina on the Chukchi Sea. Dial was accompanied by Ryan Jordan, 36, of Bozeman, Mont., who publishes Backpacking Light Magazine, and Jason Geck, 33, a teacher at APU. “I think everybody was a little apprehensive because it was such a daunting distance,” Dial said. Dial, the only one to go all the way from Kivalina to the Dalton Highway, completed the trek in 23 days and 8 hours. The trio started June 11, following animal paths and picking routes along gravel bars and ridge tops as they moved first north and then east, at one point crossing over the Brooks Range. They also made dangerous chest-high crossings of rivers swollen with snowmelt — one time inflating the waterproof bags they kept their food in — to swim across a wide channel of the Colville River. The route the hikers took included stopping at the most remote spot in the United States, defined by the team as that place farthest from roads and towns. The spot, pinpointed with the help of global positioning satellites, is along the Ipnavik River, 120 miles from the villages of Ambler and Atqasuk, and about 380 miles northeast of Fairbanks, Dial said. “We walked to it and took some pictures,” he said. On the second day of the hike about 30 miles from Kivalina, the trio surprised a grizzly bear on the Wulick River. The bear was eating a moose and did not want to be interrupted. Dial was in the lead when the bear took a couple of steps toward them. They took a couple of steps back and began yelling at it. Dial said there were a few tense moments before the bear slowly moved off. It was then the hikers discovered the moose carcass. “It explained his begrudging behavior,” Dial said. Jordan said one of his favorite moments was finding some ancient Inupiat hunting structures with arrowhead fragments and piles of caribou bones on a ridge between Surprise Creek and Kokolik River, near the northernmost point of their route. Then, there was the time a large, white wolf followed the hikers for about a half-hour. “We howled at it and it howled back,” Dial said. In the beginning, the trio walked 10 hours a day, stopping every two hours to rest and drink at least a quart of water each, dipping it straight out of rivers and streams. Jordan walked five days and nearly 100 miles when he twisted his ankle. “I fell through a small section of rotten shelf ice over a creek and landed onto my ankle,” he said. Jordan walked another 80 miles on the bad ankle before the pain got so bad he couldn’t ignore it. He initially thought it was just a bad sprain but as the swelling went down he could see the ankle was badly bruised and not holding together very well. “The pain went through the roof,” he said. A Bush pilot was called and Jordan was picked up from a gravel bar on the Utukok River, about 170 miles into the trek. It turned out that he’d torn a tendon and ligaments in his lower leg. Dial trekked on with Geck. Now that their packs were lighter, the two often hiked four hours without stopping and usually put in at least 12-hour days. 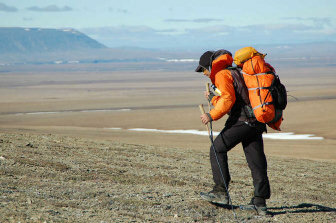 In one 22-hour period, they hiked a marathon 49 miles to reach Anaktuvik Pass. Geck, whose goal was to reach Anaktuvik Pass, decided he’d go home. Geck said he went through his food pretty fast and was hungry by the second week. Geck, who is 5 feet, 11 inches, ended up losing 15 pounds, going from 163 pounds to 148 pounds. Dial’s trek ended north of Wiseman at about midnight on July 4. He had some food left over in his pack, mostly small amounts of noodles, olive oil, brown sugar, powdered milk and cereal. He also has a full can of potato chips. Along the way, the 5-foot, 11-inch Dial lost 14 pounds, going from 177 pounds to 163 pounds.